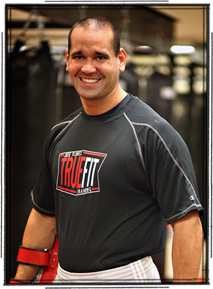 As chief instructor, fitness director, and nutrition specialist, Jose is brings 20years of results to his group and private clients. Jose took the TrueFit Challenge 16 years ago. He transformed from 220 lbs of fat to 165 lbs of lean solid muscle! “Fitness and nutrition are a way of life” says Jose. “You have to be committed to change, a change that will transform your body for the rest of your life”. As a certified personal trainer and advanced sports nutrition specialist, Jose is living proof that through the diet and exercise, change happens! Jose was introduced to triathlons in 2008, and since then has competed in over 150 races at all levels, from Sprint to Ironman distances. He's been on the podium on numerous occasions, and has maintained a good race record for his age group. Jose has completed 12 Full Ironmans, 15 half Ironmans, and qualified in 2012 for the U.S.A. Triathlon Olympic Distance National Championships by ranking in the top 10 percent of competitors in the United States. In addition to competing, Jose coaches, trains, and gives nutritional counseling to triathletes competing at all levels of the sport, from beginners to experienced. As the TrueFit’s Head Personal Trainer, Sara has a Bachelor’s degree in Exercise Sports Science, Health and Fitness Management. Crowned Ms. Heart of the Hills in 2006, she brings discipline, determination, and experience to TrueFit. Sara not only talks the talk but walks the walk. Sara shares in rotating sessions with private training programs, and encourages you throughout your TrueFit Transformation.